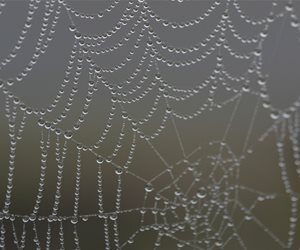 While leaving a few spider webs intact will create a spooky atmosphere, I suggest growing plants with black flowers and foliage. 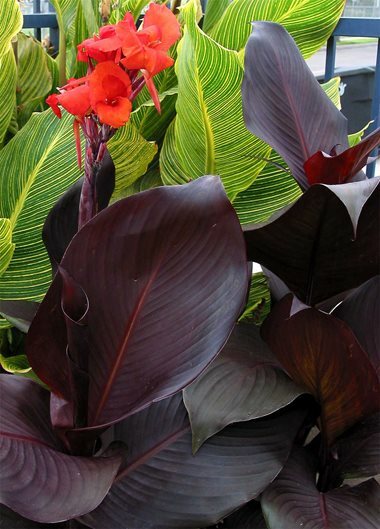 Halloween's the perfect excuse to indulge in the rich colors and bold contrasts that black flowers and foliage provide. 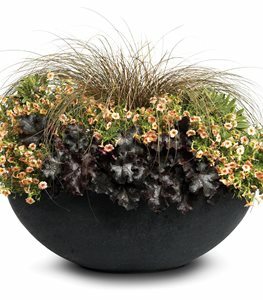 While the color black usually calls to mind chic urban settings or your favorite slimming outfit, black's equally at home in your garden, provided you pair it with the right colors to show it at its best. 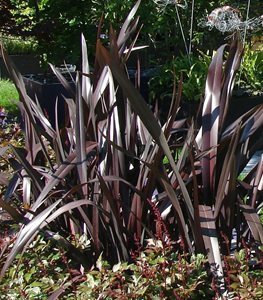 Plants with grey foliage provide the perfect backdrop to black flowers or leaves, because the lightness of the grey helps the black "pop". Bronze or amber tones also make a natural pairing with black. The unexpected color combination makes people's heads turn. 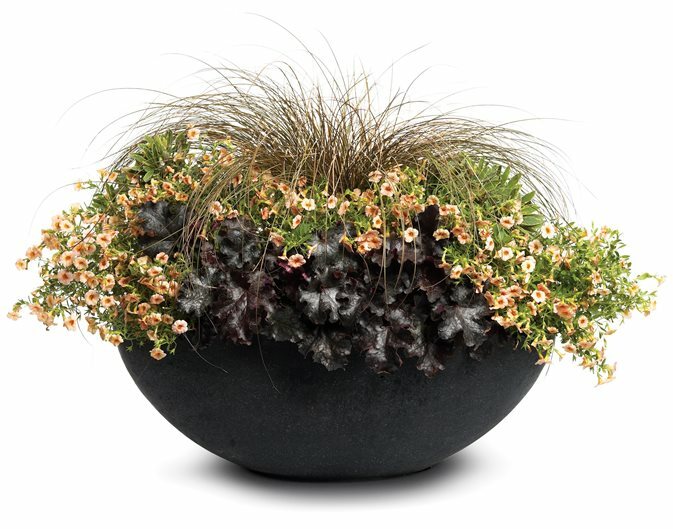 However, black, grey, and bronze often look best as accents or focal points in the garden. 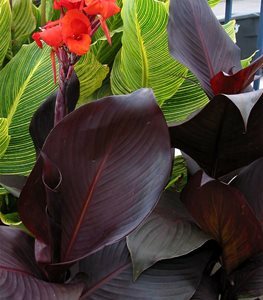 Lush green and chartreuse foliage provide a needed balance, so that your black plants shine vibrantly rather than look dull or dead. 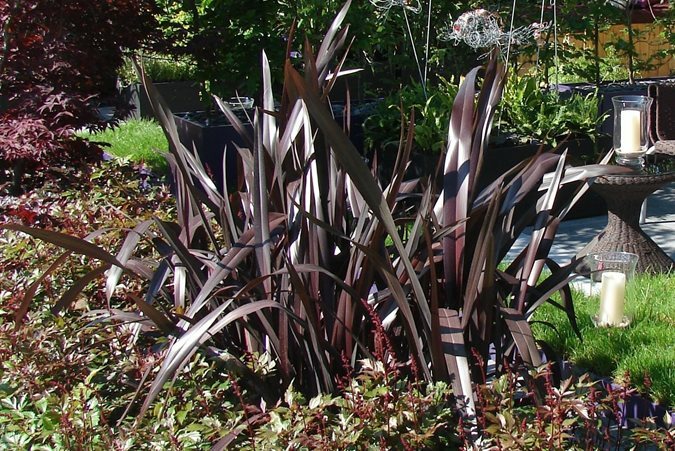 Take a walk on the dark side and plant these six striking black plants in container combinations for Halloween, or in the landscape to enjoy year-round. 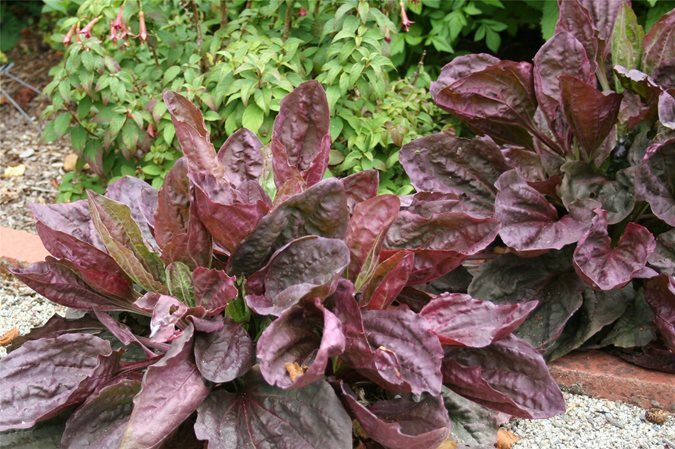 While many people are familiar with the wide variety of coral bells available, purple plantain's still relatively unknown in landscaping circles, though it offers similarly exciting foliage and an even tougher habit. 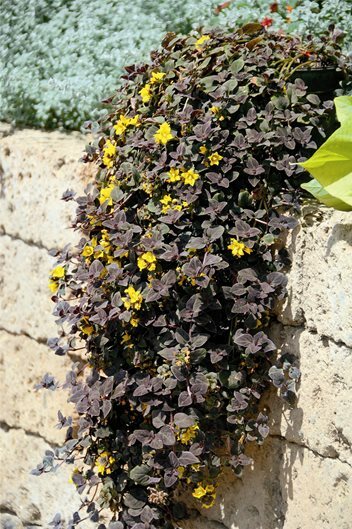 It's hardy to zone 4, and can tolerate both wind and compacted soils if given full sun. 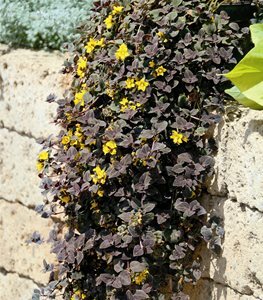 The deep purple foliage brings a perfect contrast to chartreuse or green plants, and it makes an ideal edging plant, since it stays low and looks good year-round. In summer, it puts out little spikes of white blooms which age gracefully into brown seeds for fall. While it isn't a thug, it will propagate itself for you, so within a few years you'll have enough to fill the border. 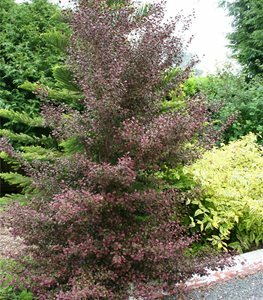 This blackish-purple shrub solves one of the perennial problems in the garden; what to plant that's tall but not wide? It reaches 8 feet tall, but can be kept a petite 3 feet wide with just a bit of pruning. 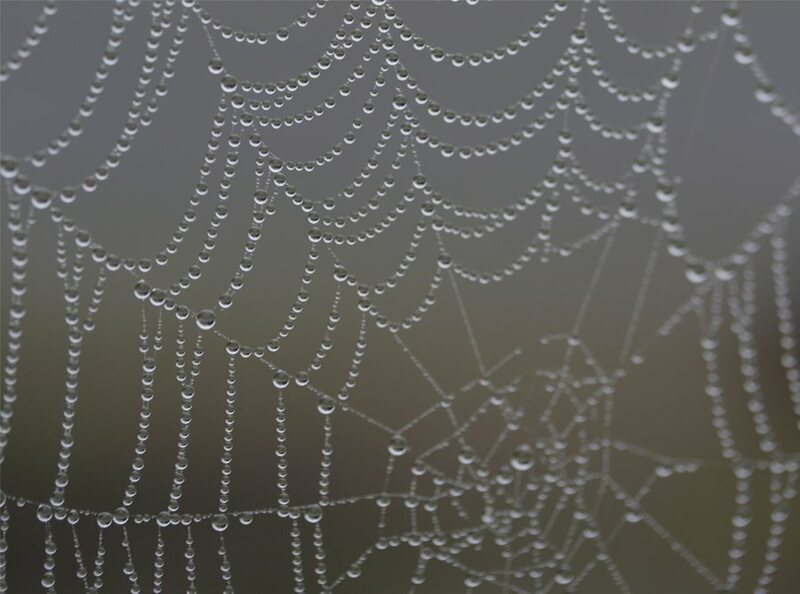 This makes it a great choice for hiding vents or rain gutters, without the size seeming out of scale with your home. 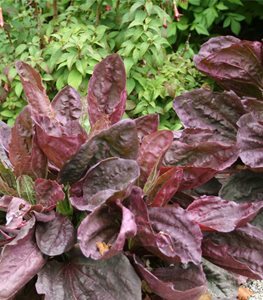 The rounded, wrinkled leaves have a shiny appearance, and the color is an attractive shade that fits in with nearly any planting scheme. It's hardy to zone 8, and since it's from coastal New Zealand, can tolerate windy sites with ease. 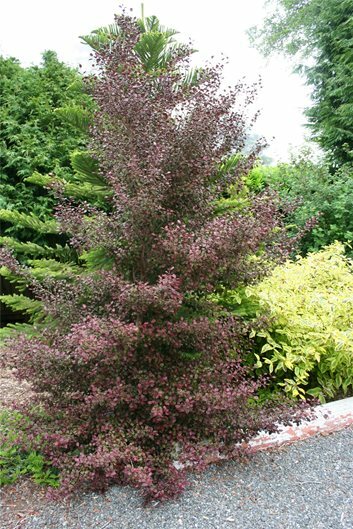 Plant this attractive evergreen shrub near your front door, and at Halloween, tuck a few tombstones and giant spiders around it for a deliciously dark display.